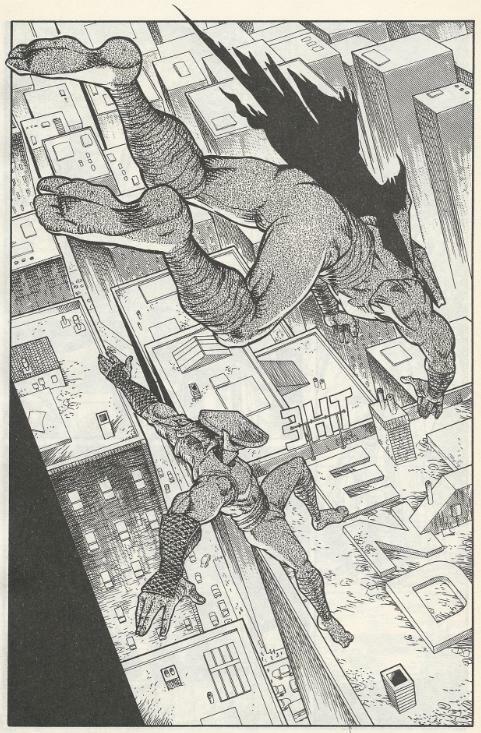 In New York City, Donatello calls the phone number left by Karai and arranges a meeting with the Foot Clan. Raph presumes that she’s setting a trap, but Mikey has the strange hunch that they can trust her. At an abandoned plant, Leonardo comes to. Karai dismisses her Foot Soldiers then frees Leo from his bonds and returns his swords. The other Turtles arrive and she introduces herself as the leader of the Japanese branch of the Foot. 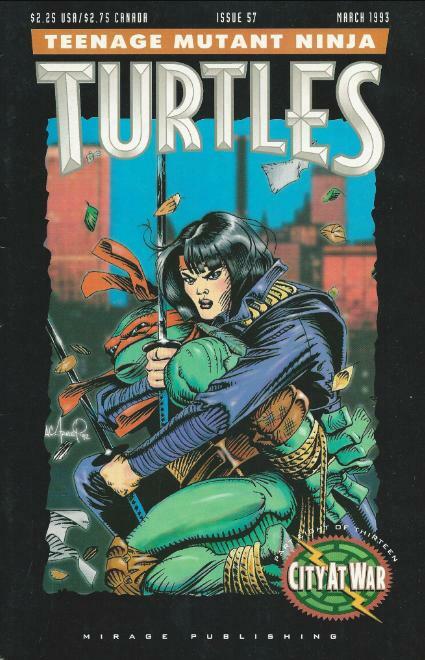 The Turtles demand answers and Karai explains that the death of the Shredder has left a power vacuum in New York City. Toward the end of his reign, the Shredder began to cut ties with the Japanese branch of the Foot and the New York branch became gradually more independent. Upon his death, the New York Foot fractured into factions: those loyal to the Shredder’s cause (led by the Foot Elite Guard) and those still loyal to the Japanese branch. Karai had hoped that the warring factions would wipe each other out and allow the Japanese branch to start fresh, but after months of waiting, she has determined that their organization’s secrecy has become a risk. 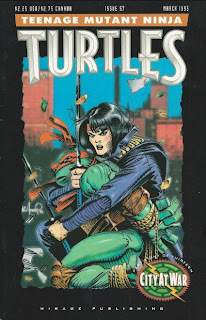 Karai proposes a bargain: The Turtles help her defeat the Elite Guard and restore Japanese power to the New York Foot and in exchange the Foot Clan will cancel their feud with the Turtles and never bother them again. 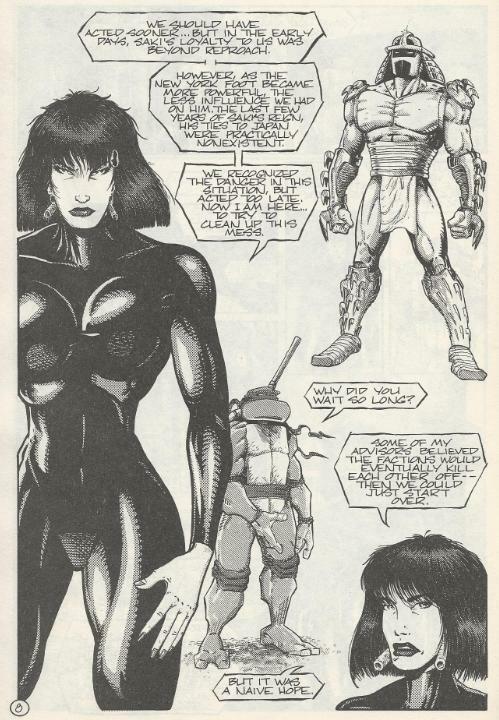 Karai leaves, telling them to consider her offer, but to consider it quickly. In Colorado, Casey and Gabe look over the classifieds in the hopes of finding a bigger place to raise their upcoming child (who looks to be on the way very soon). Gabe worries about the expenses of a house, but Casey promises that they’ll make it work. Elsewhere in New York, April and Robyn attend the funeral of their father. After the service concludes, April tells Robyn that she doesn’t want to return to California with her, but that she intends to stay in New York. Robyn asks why and April explains that moving to California was just an excuse to run away from her problems and that she’d rather not abandon the life she used to have. In the abandoned smokestack, Splinter has a vivid nightmare in which the Rat King transforms into a giant rat-monster and demands that Splinter swear obedience to him. Splinter awakens and, finally, succumbs to the Rat King’s urgings and catches, kills and eats another rat. Having seen this, the Rat King laughs and tells Splinter that he has made his destiny clear. In New York City, Karai’s Foot Soldiers continue monitoring the abandoned water tower. They’re attacked and slaughtered by the Elite Guard, who seize their files and learn that the Japanese Foot have been monitoring the Turtles (in the hospital, the old man receives physical therapy). The Elite Guards crumple the photos and disappear. *This story is continued from TMNT (Vol. 1) #56. The story continues in TMNT (Vol. 1) #58. *For those keeping track, according to Karai, one year has passed since TMNT (Vol. 1) #21. 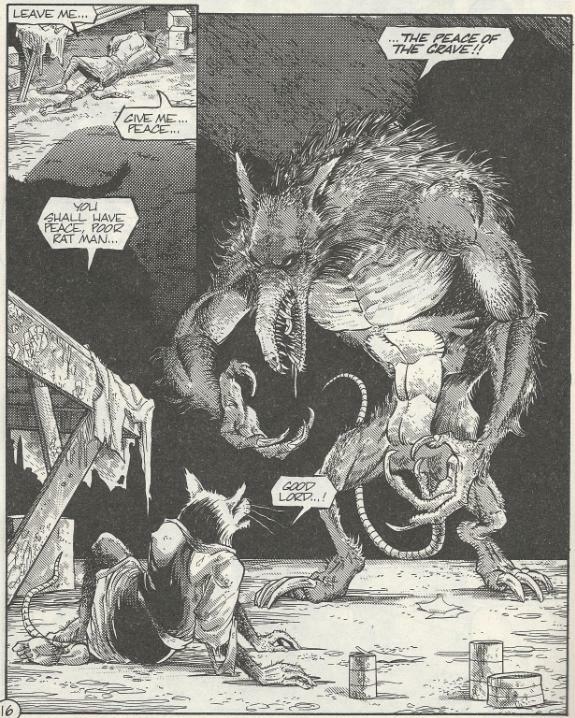 *Though it isn’t stated, I would like to think that in Splinter’s nightmare, the Rat King was taking on the form of the Adversary from TMNT (Vol. 1) #37. *This issue also contained a bonus 1-page comic, “New York ComiCon: A Trip” by Chuck A. Dillon, Jim Lawson and Stan Sakai. You can bisect “City at War” pretty neatly down the middle. The first half of the arc features everybody being miserable or lost (well, except Casey) while the second half is where things rather abruptly begin to turn around. It began last issue, but you really start to see the changes with this installment. April decides that she’d rather live a life running from scary ninja and blood-thirsty monsters than spend another minute in LA, Splinter finally swallows his pride and then swallows a rat, and the Turtles get a much needed opportunity from a very unlikely benefactor. If anyone in the audience was starting to think that “City at War” was spinning its wheels, the storyline really gets underway starting here. And all of that is best encapsulated in the one story arc of “City at War” I’ve yet to comment on whatsoever: the old man. He’s basically a personification of the attitudes and spirit of the main cast during this entire ordeal and we’ve been watching him get hurt and heal through one-panel chunks since this thing started. When the story began and the cast separated and the “family” was broken, the old man was injured and placed in a body cast. When the cast found their new situations disorienting and felt lost, the old man was shown staring out a window or plodding around the hospital with a hopeless look on his face. Now with this issue, as the characters are beginning to take control of the situation and fight back, the old man is shown engaging in physical therapy to help heal his wounds and get on with his life. While the symbolism might seem more than a little trite, I think he also serves to illustrate how the titular “City at War” affects your average bystander that has nothing to do with the conflict. Being hurt, lost and then gradually recovering isn’t some situation unique to the Turtles or their supporting cast, but something that EVERYONE goes through during a crisis in their lives. It brings the matter down to earth and in a way makes us all feel a little closer to the heroes. I can't help but think that this issue's cover was the proverbial face that launched a thousand ships (fan-fics, that is). One insight of your City at War reviews that I really appreciate is how you are recognizing potential themes from the McCollum/Anderson stories that may be manifesting themselves in Splinter's storyline. As much as I had always appreciate "The Twilight of the Ring" for its artistic vibe, I never thought about all of their TMNT short stories collectively playing up the Man vs. Reptile aspect of the Turtles' identities. Zulli was also playing a similar tune with his contributions. And now we get Splinter's storyline in which he faces off against some personal demons that appear to take the form of The Adversary... which I never even thought about until reading your review! I don't know if Eastman, Laird, & crew consciously wanted to build upon the foundation of the McCollum/Anderson/Zulli themes inherent in those "non-canon" stories, but it really does add quite a bit of depth to the overall narrative if you read City at War in light of those works. That's very true. "City at War" was written with the whole of TMNT fiction in mind and builds on themes created not just by the in-house staff at Mirage, but the guest contributors, too. The McCollum/Anderson themes as you mentioned are a major part in Splinter's arc, but the significance of Casey's Chevy in his storyline is a huge theme, and that received its foundation in the Rick Veitch stories. This is one of those situations where trying to stick to a rigid "canon vs. non-canon" chronology leaves the reader at a disadvantage, as there are concepts introduced in many of those "non canon" guest issues that really come into play with "City at War". Even if the issues aren't directly cited, their influence is ever-present.